I recently appeared on the San Diego Living TV show on San Diego’s XETV. It was rather a last minute kind of thing. 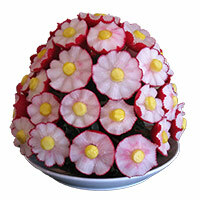 I got in invitation on Friday to appear on Monday morning. So I carved a few pumpkins over the weekend. In this article, you can get a closer look at the pumpkins I carved as well as a peek behind the scenes in the XETV studio. Here is the segment. Here is a better look at the pumpkins that I carved for the show as well as a quick look behind the scenes. One was a pumpkin portrait of the host, Courtney Dwyer. I had the producer who invited me send me a high resolution photo of the host that I would be with on the day of the TV show. Courtney was not expecting the pumpkin with her image and when she saw it she exclaimed that it looked just like her. 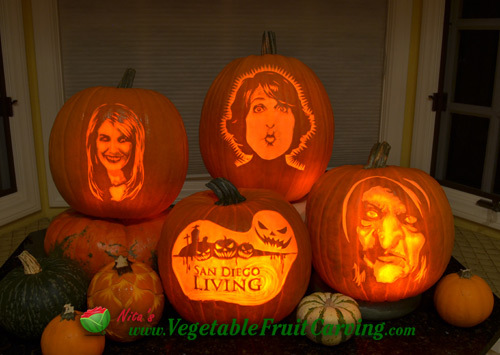 Pumpkin carving of San Diego Living TV Host Courtney Dyer. I wish I had gotten a better photo of it with better focus and lighting but here it is. It you want to learn how to carve recognizable pumpkin portraits of your loved ones or customers, I show you exactly how, step-by-step in my Pumpkin Carving Portrait Course. 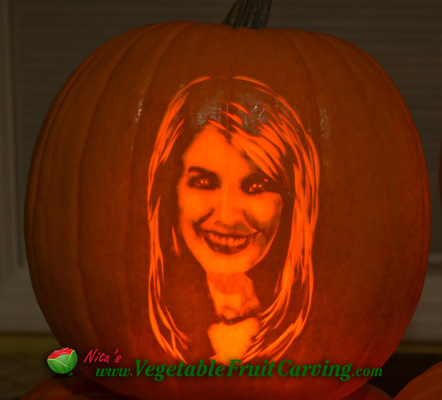 It’s fun to carve portraits on pumpkins and watermelons any time of year for wedding, birthdays, anniversaries and more. 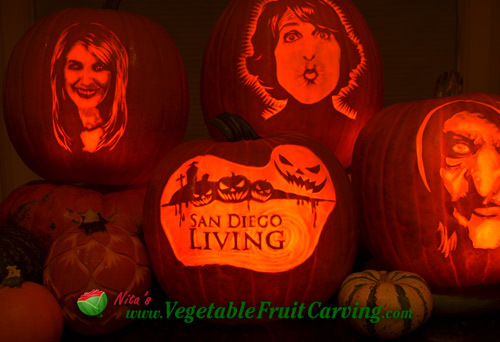 Pumpkin carved by Nita Gill with the San Diego Living TV show logo with a Halloween motif. Another pumpkin I carved had the San Diego Living logo with a Halloween motif. In it I did what I caution beginning students not to do. I made the serifed letters in the pattern too small. So, the smaller thinner letters ended up being very time consuming to carve. It would have been so much easier and faster had a started with a bigger pumpkin and a bigger pattern. It’s just that the store I went to to get my pumpkins did not have larger sized pumpkins. Oh well. I carved the portrait of me giving a kiss because it’s a fast and easy one to carve. I also teach how do make simple 2 toned portraits like this in my Pumpkin Carving Portrait Course. And the witch was carved using the pre-printed pumpkin tattoos that I sell in my online shop. This particular pattern is from the classic collection. You can carve it, too. 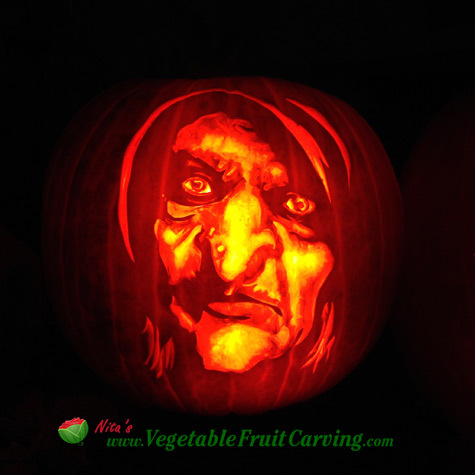 Scary witch pumpkin carved by Nita Gill for San Diego Living TV show using a pre-printed pumpkin tattoo which is available in our online shop. If you’ve never been on the inside of a TV studio, you might find the following 2 videos interesting. A lot is going on behind the camera at any one time during this live show. While the host is shooting some of the show other guests are getting ready in one or more of the many areas of the studio, camera men and producers are on the set, and sometimes guests, like my husband are also hanging out behind the scenes. Take a look at this 2 very short videos I shot with my phone while there. After my segment was over, we hung around because they wanted to shoot my pumpkins for the rest of the week’s shows at the end of the show. 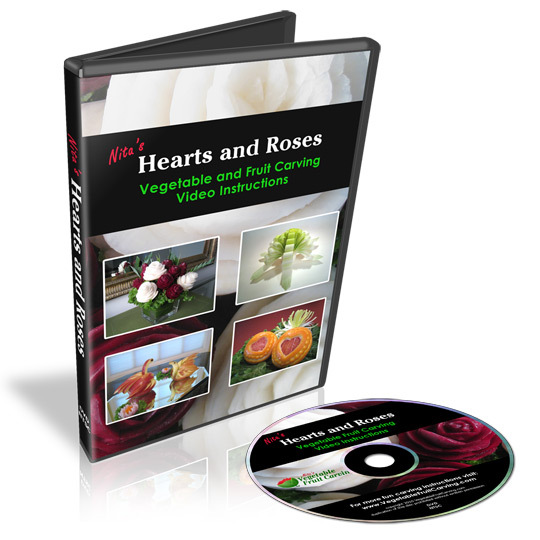 So I shop a little video to share with you. You might wonder how I can get away with talking like this during shooting. Actually I wasn’t. I added my voice over after the fact. You have to be quiet while the cameras are rolling. 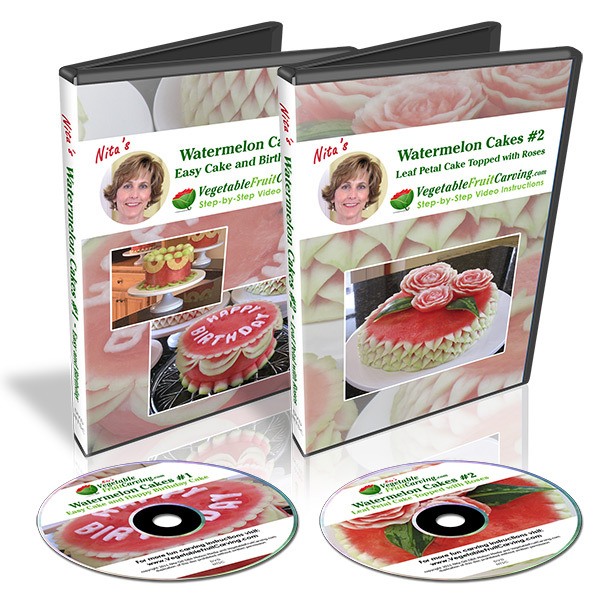 I am certainly not the only fruit carver to get a spot on TV. Several of my students have also appeared on local news and a Food Network show. When you learn how to carve fruits and veggies, you might get on TV, too. Here is a link to my appearance on the XETV San Diego Living website. If you want to see my 4th of July appearance on the live San Diego Living TV show it’s on another of my blog posts.